Editorial note: This is the first in a series that explores the sculpture of New York’s cemeteries. 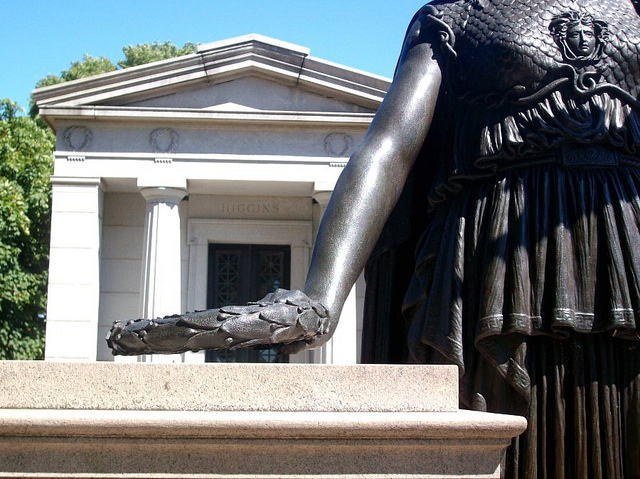 Some of the most beautiful sculpture in New York is dark adornment to the city’s cemeteries, stunning reminders of transience conveyed through the semi-permanence of stone and metal. 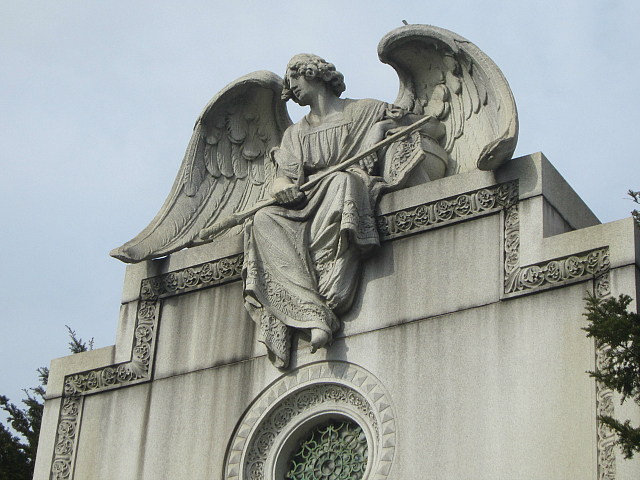 In each of the five boroughs are these green spaces with their displays of mourning: elegant angels, etched symbols of remembrance and solemn statuary that transmit the stories of the dead, as well as the history of art in the city. 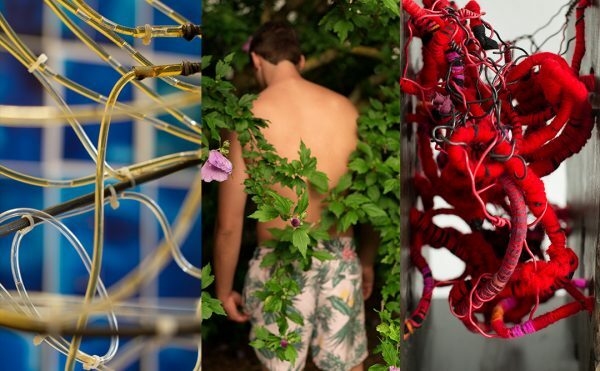 While cemeteries are no longer central to our lives in the way they were in the past, when they were the parks and museums where the public would wander, they still offer fascinating explorations into art and the history of New York, where the city’s past sprawls above the bones of its former residents. 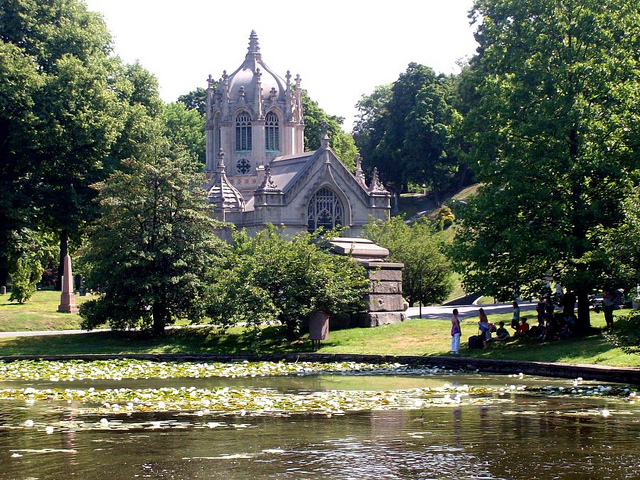 With its serpentine paths and lush landscaping, along with a wealth of 19th century sculpture and the graves of many of the most significant New Yorkers, Green-Wood Cemetery in Brooklyn is the perfect place to start to delve into cemetery exploration. Since moving to the neighborhood around it shortly after I arrived in New York, I’ve been captivated by the place, discovering something new every time I walk under its spired Gothic entrance by Robert M. Upjohn. I now lead walks there periodically with the Atlas Obscura, an organization devoted to the hidden wonders of the world, and have continued to discover cemeteries around the city and how they relate to its history. 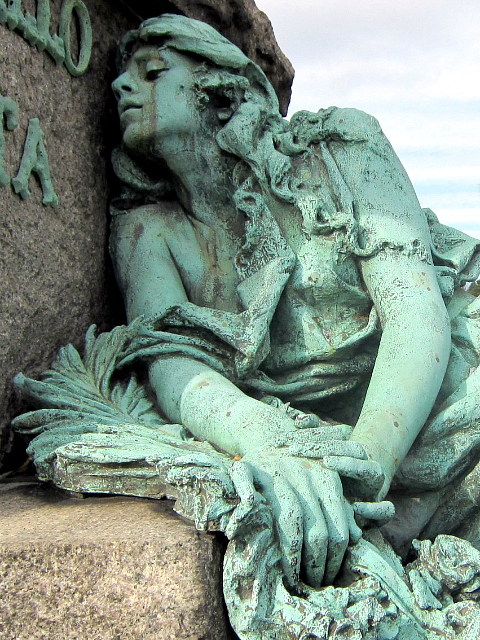 Green-Wood Cemetery was established in 1838, the first rural cemetery in New York City to embrace the Victorian ideals of gardens, as well as the elegance of remembrance through elaborate mausolea and sculptures. It was also a necessity, as the churchyard cemeteries in Manhattan were more like ghastly mounds of bodies than burial grounds, packed high over the sidewalks with layers of the dead from the rising population, spreading diseases that only contributed to the unmanageable crowd of corpses. 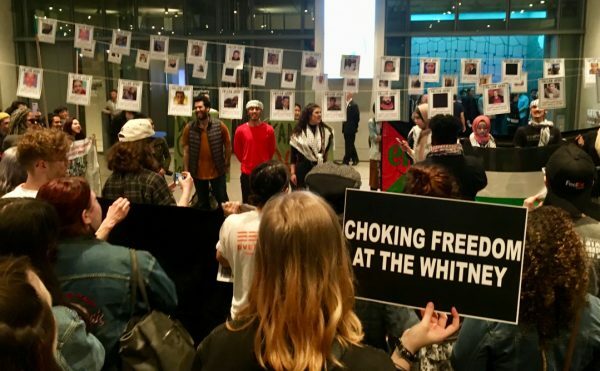 They were also right in the middle of everyone’s daily existence (imagine how Trinity Church in Lower Manhattan has its graveyard right on Broadway and Wall Street). Yet just across the water were acres of unused farmland where the dead could be buried. Instead of just a dumping ground for all the unfortunate deceased, Green-Wood was to be a place of peace and even recreation, where picnics and carriage rides would be held amidst the tombstones, a somewhat morbid precursor to Central Park which would be created in 1857 and influenced by the public popularity of Green-Wood. 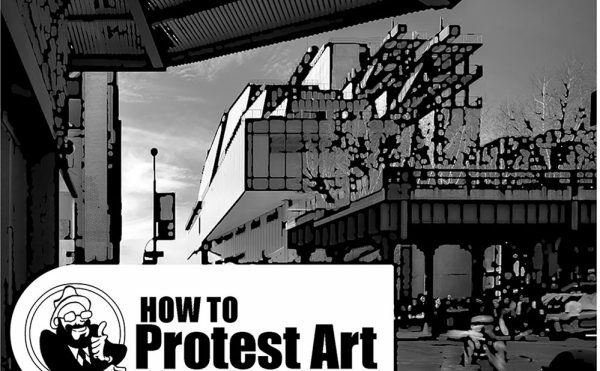 It was also where 19th century sculptors would display their work, as the Metropolitan Museum would not be founded until 1870 and collectors were willing to make a final significant art purchase for their final resting spot. 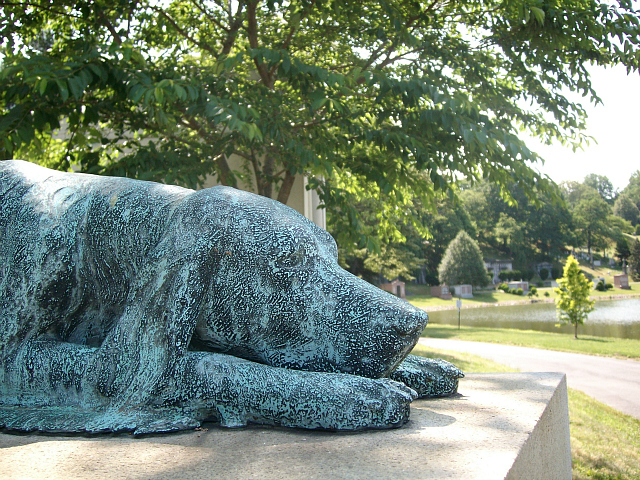 A walk through Green-Wood today, which now includes 478 acres and around 600,000 interments, is not unlike going through the American Wing of the Met, with work by great 19th century artists, including Augustus Saint-Gaudens, Daniel Chester French, Henry Kirke Brown, John Quincy Adams Ward and Solon Borglum. 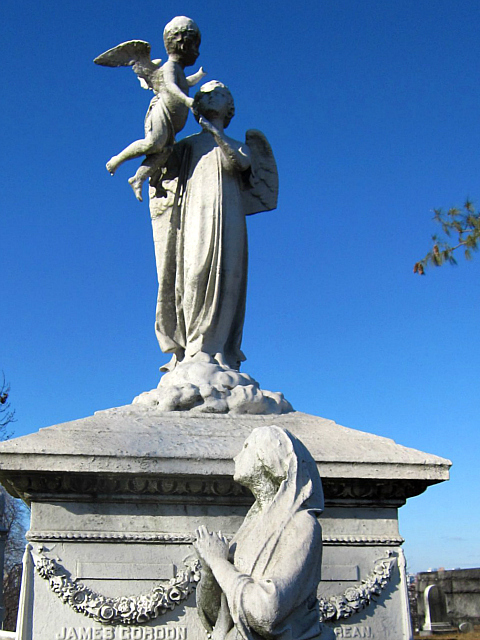 The Green-Wood Historic Fund has done incredible work in leading the preservation and restoration of many of the sculptures and monuments at the cemetery, as due to pollution and other damage, marble and bronze aren’t as permanent as they would seem. The above bronze of Dewitt Clinton, who was a prolific politician serving as mayor of the city, New York Governor, and Senator, is by Henry Kirke Brown, who also created the equestrian statue of George Washington in Union Square. 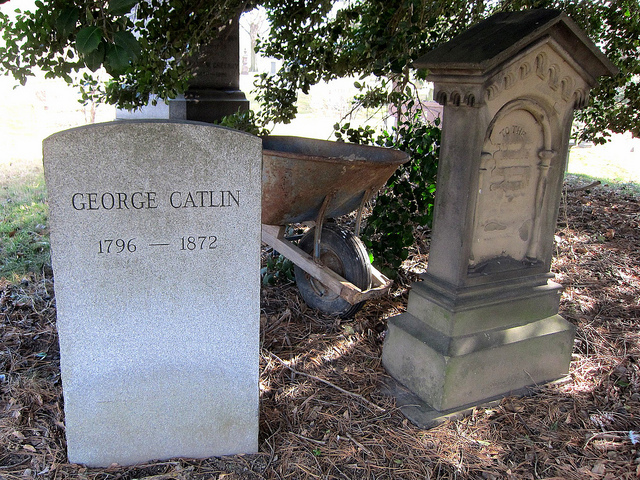 It is especially interesting as Clinton actually died in 1828, before the cemetery was open. To help popularize the new cemetery and give it an elite air, the legendary Dewitt Clinton was dug up from his grave and relocated to Green-Wood, this sculpture, one of the first bronzes cast in the States, being dedicated in 1853. A recent restoration has made it look as if it was created much more recently than 150 years ago, and even if you didn’t know that Dewitt Clinton had led the construction of the Erie Canal or had been a major presidential contendor against former US President Martin van Buren, you could guess through his monumental size with Roman robes draped over his 19th century attire that he was a formidable character. As Green-Wood thrived and the drive to unearth famous people and reinter them went away, funerary work from international artists was erected alongside that by American sculptors. 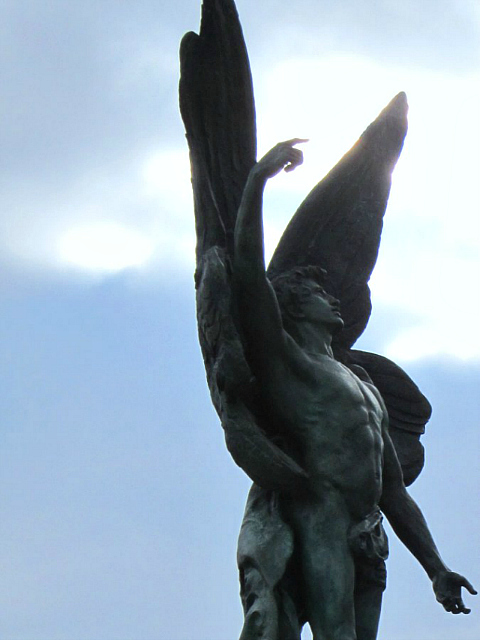 The most dynamic sculpture in the cemetery is an angel by Adolfo Apolloni, an Italian sculptor active in the early 20th century who created many monuments in Rome, most notably as a sculptor working on the National Monument to Victor Emmanuel II. The sculpture in Green-Wood, known as the Valentine Angel as it marks the Valentine burial plot, was cast in Italy, and is incredible to walk around, with the draping of the angel’s robe flowing back from her body as if she is about to take flight off her stone pedestal. 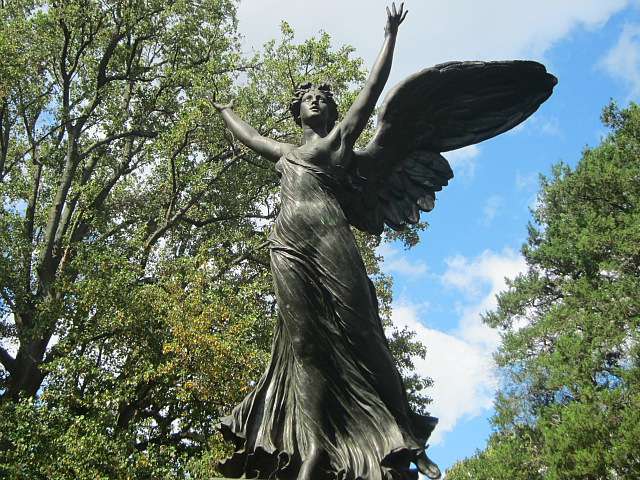 It has the same tangible, living power of the angel on the Bethesda Fountain in Central Park (sculpted by Emma Stebbins, who happens to be buried in Green-Wood), except with something more exaltant and even defiant, with her arms raised to the heavens against the death below her feet. Another striking sculpture from the early 20th century is the monument to Rose Merello Guarino, a bronze of a woman collapsed against a grave clutching ferns and flowers (symbolic of the resurrection and life cut off in its flourish), her hair tossled and dress slipped down her shoulder. Rose was a daughter in the wealthy Merello family and fatally shot and killed at a young age by a vengeful caretaker in their home. Probably the most visited work of art in Green-Wood is the statue of Minerva. 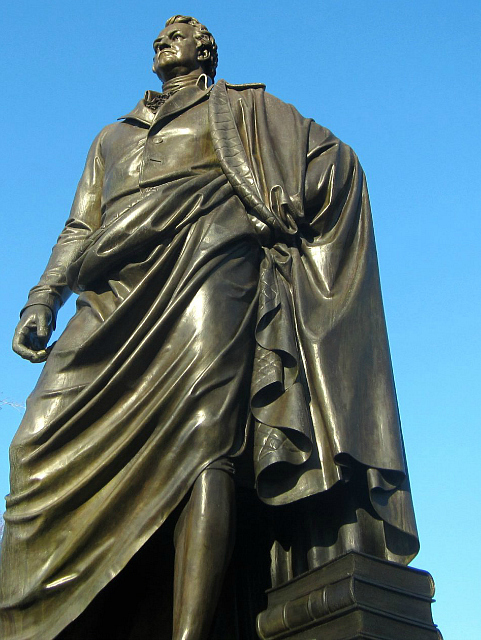 Funded by businessman Charles Higgins, whose mausoleum is just behind the statue, it was dedicated in 1920 on Battle Hill, the highest point in Brooklyn and the site of the first major engagement of the Revolutionary War. The bronze Roman goddess, sculpted by Frederick Wellington Ruckstull, raises her arm to another metal lady out in the harbor, with the Statue of Liberty returning her salute. 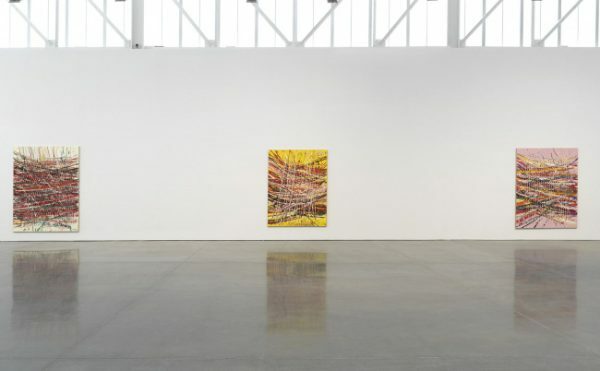 Of course, few gatherings of art are without their faults, especially when it comes to self-memorializing, where the ostentatious often wins over subtlety. John Matthews, the “Soda Fountain King” who made his fortune on carbonated water innovations, rests beneath a catafalque designed by Karl Muller at a cost of $30,000. The style of tomb is usually reserved for royalty, yet a now badly worn statue of Matthews rests below a canopy of engravings of his life, including pensive moments on the idea of soda water. 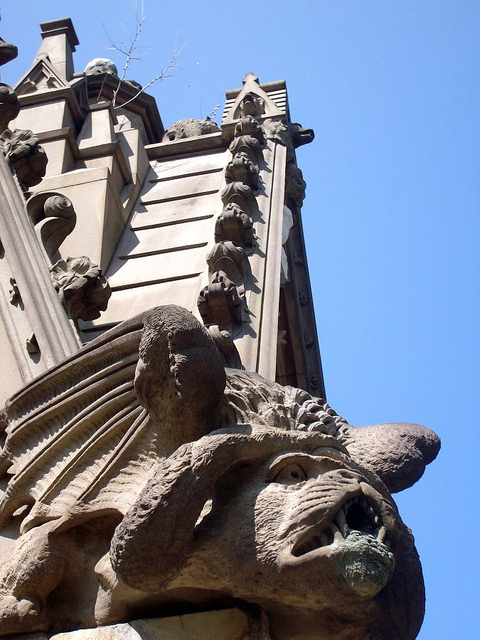 The art critic Effie Brower called the monument with its garish water-spouting gargoyles and jumble of spires “depraved,” although it did win an award in mortuary art in 1870. 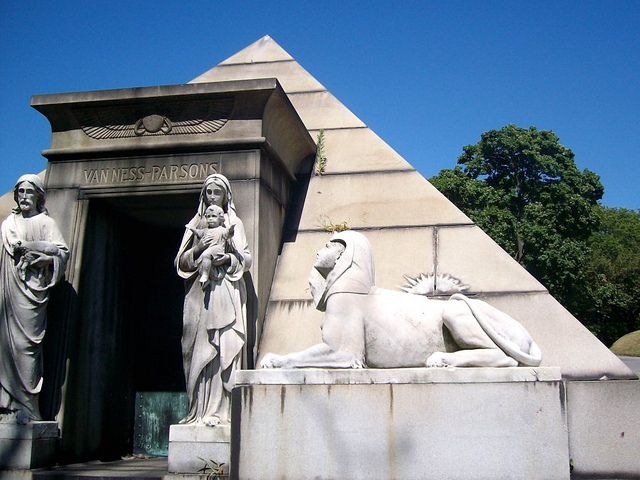 In addition to its above-ground monuments, Green-Wood also has many notable artists interred in its grounds. 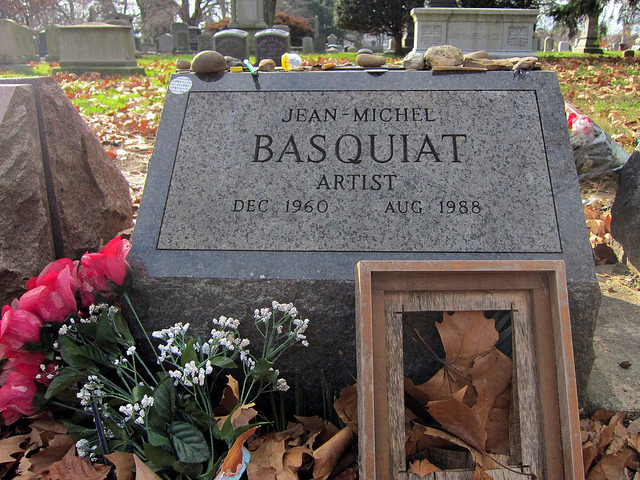 Jean-Michel Basquiat, who died at 27 in 1988, is buried in an obscure row of low graves in a far plot of the cemetery. Visitors leave stones and MoMA stickers on the painter’s grave, along with hand-written notes, art supplies and stubs of cigarettes. There is also the playful memorial to William Holbrook Beard, known for his paintings of anthropomorphic animals, such as “The Bulls and Bears in the Market” (1879) at the New-York Historical Society, where animals rampage at the Stock Exchange. 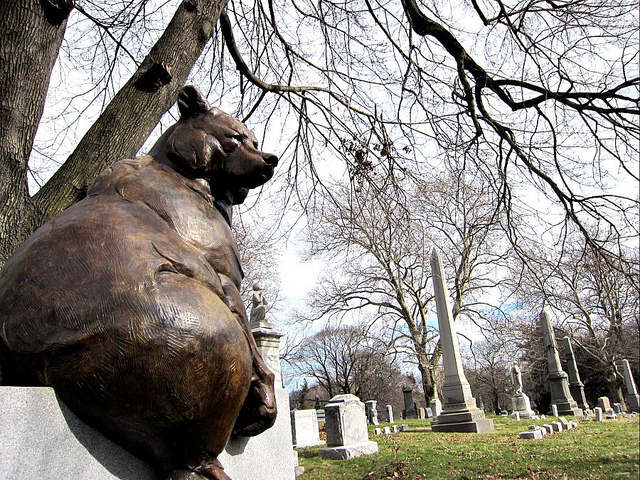 The bronze bear on his tombstone was created and donated by Dan Ostermiller to give the influential artist a fitting tribute when previously he was in an unmarked grave. While George Catlin, the great 19th century painter of the Old West and American Indians, is buried under a simple monument (that also seemed to be a hiding place for a wheel barrow), he is another of the significant artists that make Green-Wood continually relevant in terms of maintaining places for remembering history. 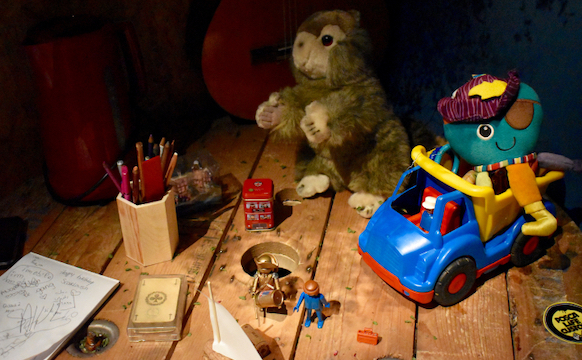 He is also one of the artists to have had work acquired by Green-Wood for their collection of paintings and art by their permanent residents. While not currently on public display, the collection includes work by William Merritt Chase, Louis Comfort Tiffany, Currier & Ives, John La Farge and Vestie Davis. It’s impossible to take in all of Green-Wood on one visit, but even an afternoon stroll reflects how cemeteries mirror contemporary society as silent cities shadowing those of the living. The history of New York, from its 19th century gentility and its city shapers like Boss Tweed or Peter Cooper to its present figures and columbariums (buildings containing urns) of sharp modern design, is all preserved here, along with an impressive legacy of sculpture among the hundreds of thousands of tombs, which continue to amass as Green-Wood continues to operate as one of New York’s most stately cemeteries. 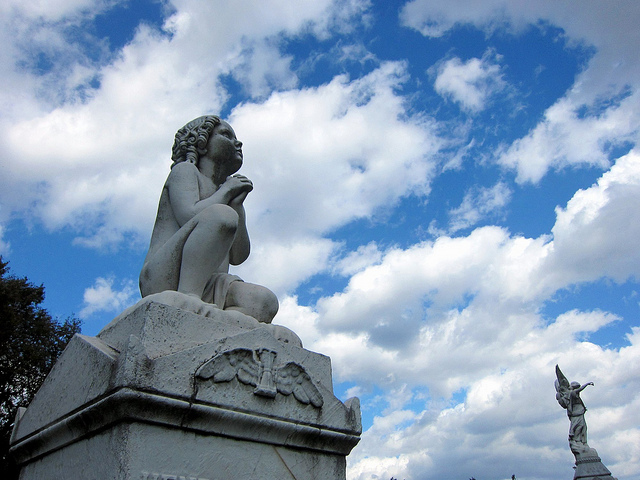 Green-Wood Cemetery is open seven days a week year-round, with its main entrance at Fifth Avenue and 25th street in Brooklyn.